One of my neighbour's has a family 303 that their father had but is surplus to his requirements as he doesn't shoot deer any more. He just duckshoots and fly fishes now due to his maturing age. He has gifted said 303 to me(I sighted his licence and he sighted mine). She's a cut down SMLE 1915 complete with matching numbers etc. This also happened to be when I was debating about doing a Bush rifle idea thats tough as hell etc. So my query is for those out there what road could one go down? I have a few ideas being that it's not in restorable order. My idea was to leave it as is in 303, mount a scout style scope in place on the rear sight, shorten to 16" and suppress with a trigger Job. Plus for good measure pop a slip on recoil pad over the brass one as the Buttstock is original. I'm wanting to keep it cheap but I'm open to other ideas too. As long as it ticks the boxes of cheap(sub $500), Can get out to 250 with factory ammo on reds as some of our clearings down here when we Bush hunt can be big. Barefoot, Double Shot and chainsaw like this. 1) Buy a pair of Kuiu pants. 2) Put a 26" carbon wrapped barrel on it. 3) Chuck it in a carbon stock. 4) Replace the action with a Stiller. 5) Cerakote the entire rifle to match the colour of your Kuiu pants. Nah screw that. Wood/blue is the best. Double Shot, Nick-D, Daithi and 1 others like this. Would be perfect i reckon, ive got a mosin that was done to, carries like a dream, and so far has dropped everything I've pointed it at within 200 metres. Perfect spook n shoot. bumblefoot and viper like this. erniec and Grey Kiwi like this. The key requirements being tough, quick handling and stopping power. Plus it litterly didn't cost me anything. Scout/pistol scope up front or a rail on left side of receiver, side mount scope (or red dot, why not!) allows you to load her with stripper clips. If (very) poor accuracy, go for cast boolits but you are talking sub 200m, so can't go wrong. 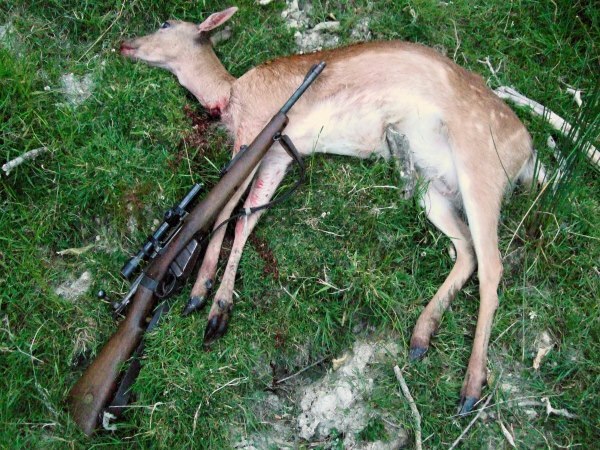 the kill zone on a deer is a dinner plate size so if your rifle shoots even 6" at 100 then its going to work just fine for you. I actually enjoy using the old SMLE (above) more than the 7-08! Mine easily shoots 3-shots into 3" at 100m using Highland 150's and with the 2.5x scope. So you may be quite surprised with its accuracy. I have a spare FF2 sitting spare. 3-9 x40 which would be overkill but cost 0. I've gone down a similar path with an old cut down Lee Enfield mk4 no1 I picked up 20 years ago. It now has: monte carlo stock, recoil pad, 19 inch barrell, hardy suppressor, scope mount, sig sauer red dot.